Firstly you need to consider which apps will suit your music best. Is your aim to recreate acoustic or electronic sounds, are using using loops or playing live. 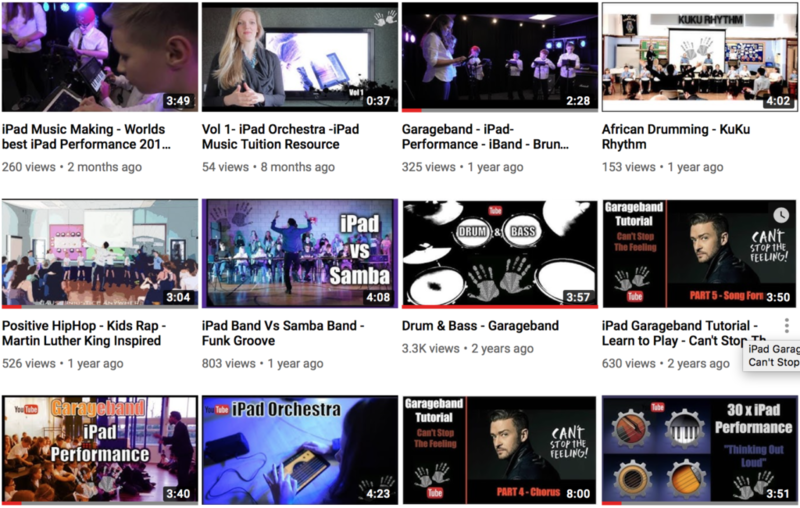 In the videos linked in this posts, we used GarageBand exclusively. Lets assume you’ve ticked the iPad box, you may want to consider amplification. You have three options. Use the speaker built into the iPad. We have used the built in speakers on a number of occasions. These work best with bright instruments like guitars, piano and strings, in a smaller room. Playing a bass or similar instrument in a large hall through these tiny speakers is not going to work. Shock! Use a headphone splitter. You can connect multiple iPads to a single speaker using this hack. Often classrooms have wall mounted speakers, you can use this connector to join the headphone splitter to your classroom audio cable. Sound system. Finally, some of you may have the ability to connect to a sound system . This may be a luxury but will produce the best sound quality by far. If your band is 4 or 5 strong its relatively easy to set up. Simply purchase a cable with a small connector for the iPad and a large connector for the sound system. Here is one of our live iPad music covers. Thinking Out Loud by Ed Sheeran. In this arrangement we have 1 iPad playing a beat. The other 30 iPads are split into instrument groups. Bass, guitar, piano, strings. We invited another class to form a choir and accompany us. Finally we added a couple of solos (1:50). The bass, guitar, strings and keys are all being played live. Its amazing what can be done when you use the iPad as a music education tool. I don’t know of any other tuned instrument lesson that produces these results in a matter of weeks! You have your equipment and apps ready to go, you have selected a song, now get rehearsing. Practise, practise, practise! When you can play with a sense of musicality perform your work. Share your creation with us! If you want your iPad music class to flow well, familiarise yourself with the musical material before each session, learn to play all the parts fluently. Watch a how to play video and build your iPad musicianship. Here’s one we prepared for you earlier. Take a moment and complete this 15 min tutorial as part of your continued professional development. The great thing about iPad music is that you can do this in the staff room, on your commute, or in bed after a long day. iPad music is all about simplicity and creativity in the palm of your hand!